SEAT ALHAMBRA, AROSA, CORDOBA, EXEO, EXEO ST, IBIZA II, IBIZA V, IBIZA V SPORTCOUPE, IBIZA V ST, INCA, LEON, TOLEDO I, TOLEDO II, TOLEDO III;. SKODA FABIA, FABIA Combi, FABIA Praktik, FABIA Saloon, OCTAVIA, OCTAVIA Combi, SUPERB, SUPERB Estate;. ITEM NUMBER A256. VW T4 TRANSPORTER 2.5TDI. VW CORRADO 2.9 VR6. VW CADDY VAN MK2. 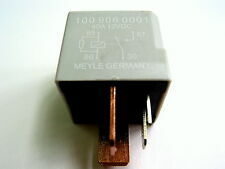 A NEW ECU RELAY (NO: 109). VW GOLF MK3 2.8VR6. VW GOLF MK4. (YOU MUST CHECK THE PART NUMBERS ON THE OLD RELAY FOR COMPATABILITY). Equivalent to part number: 4H0 951 253. VW, Audi, Bentley, Skoda general 12V power really. As new will be posted same day. Bulk buys discount is available just drop me a message. It was removed from a VW Golf Mk4 1.9TDI and is compatible with many Volkswagen Audi Seat Skoda models.Before purchasing you should ensure that the part number listed is correct for your vehicle, this is your responsibility. ITEM NUMBER C142. VW GOLF MK3 GTI 2.0L 8V & 2.0L 16V. A NEW ECU RELAY. 1 x RELAY AS SHOWN IN THE PICTURE. 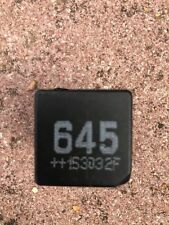 Equivalent to part number: 7M0 951 253 A.
Relay location: 3, relay number: 30. relay location: 1. relay location: 3. relay location: 37, relay number: 30. relay location: 7, relay number: 30. Toledo (1L) Saloon 2E ABF AFT AGG relay location: 37, relay number: 30 Alhambra (7V8 7V9) Multi-purpose vehicle ADY F:7M-W-507062->. ITEM NUMBER A967. VW T2 TRANSPORTER, CAMPER OR VAN. VW T1 BEETLE. A NEW 12v 5 PIN HEADLAMP RELAY. 1 x 12V HEADLAMP RELAY. SUITABLE FOR. Quality Genuine Meyle Parts. Excellent Service! PART NUMBER 165906381. MOST VW AUDI SEAT MODELS 1992 >. TOP QUALITY OEM GERMAN MADE NUMBER 30 ECU RELAY. BIG ENOUGH TO MATTER.SMALL ENOUGH TO CARE. PWE =FITTING QUALITY SINCE 1975. Equivalent to part number: 7M0 951 253 C.
VW: 111 941 583, 411 941 583 B. AUDI: 111 941 583, 411 941 583 B. OE numbers. Utility numbers. Rated current [A] 12.5 A. Height [mm] 32 mm. Width [mm] 33 mm. Length [mm] 35 mm. 1J0906381A / 1J0 906 381 A. 357906381A / 357 906 381 A. All T25 Models from 1980 to 1992. Transporter Van, Camper Van & Caravelle. Part numbers are provided for reference purposes only. Equivalent to part number: 4H0 951 253 A. 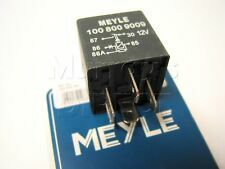 '409' Fuel Pump Relay MEYLE GERMANY 2 YEAR WARRANTY OE REF: 1J0 906 383 C FOR VARIOUS MAKES MODELS! AUDI A3 | TT Quattro VW GOLF MK4 | BORA | LUPO | BEETLE | PASSAT SEAT LEAON | TOLEDO SKODA OCTAVIA | SUPERB PLEASE LEAVE VEHICLE REGISTRATION NUMBER AFTER PURCHASE TO AVOID ANY DELAYS IN THE DELIVERY PROCESS!. RENAULT TWINGO - 1.2 - 1996-2007. RENAULT KANGOO - 1.2, 1.4, 1.6, 1.5DCI, 1.9DCI - 1997-ONWARDS. RENAULT ESPACE - 2.0 - 1984-1990. RENAULT ESPACE 2.0 - 1991-1996. RENAULT ESPACE 2.0, 2.2, 3.0 1.9 - 1996-2002. 1 x FUEL PUMP / ECU RELAY. Hazard Lights Relay. Rear Lights. Belt Tensioner Wheels & Bkts. Suspension Ball Joints. Front Exhausts Cats. Estimates can be provided beforehand but prices may differ upon ordering. Rated current [A]: 2. PART NO 111941583. T25 TRANSPORTER. CAMPER VAN. 12V HEADLAMP RELAY. 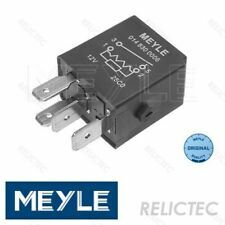 Meyle 645 Relay. 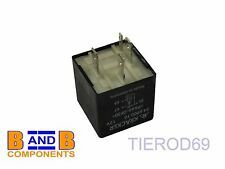 VW, Audi, Bentley, Skoda general 12V power relay 4H0951253A . As new will be posted same day. TRANSPORTER T4 Bus (70XB, 70XC, 7DB, 7DW) 09.90 - 04.03. TRANSPORTER T4 Box (70XA) 07.90 - 04.03. TRANSPORTER T4 Platform/Chassis (70XD) 07.90 - 04.03. TRANSPORTER T5 Bus (7HB, 7HJ, 7EB, 7EJ, 7EF) 04.03 -. VAUXHALL ASTRA Mk V (H) Sport Hatch (A04) 1.9 CDTi (L08). VAUXHALL ASTRA Mk V (H) Estate (A04) 1.9 CDTi (L35). VAUXHALL ASTRA Mk V (H) Estate (A04) 1.3 CDTi (L35). VAUXHALL ASTRA Mk V (H) Estate (A04) 1.9 CDTi 16V (L35). 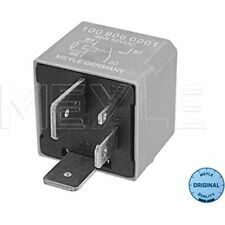 1 x FUEL PUMP / ECU RELAY MEYLE GERMANY 2 YEAR WARRANTY Brand new "109" (ECU) relay for many VW Audi SEAT Skoda diesel engined models. OE REF 1J0906381A / 1J0 906 381 A 357906381A / 357 906 381 A PLEASE LEAVE VEHICLE REGISTRATION NUMBER AFTER PURCHASE TO AVOID ANY DELAYS IN THE DELIVERY PROCESS!. Belt Tensioner Wheels & Bkts. Suspension Ball Joints. Relay function: Fuel Pump. Relay function: Wash Water Pump, headlight cleaning. Relay function: Pump, automatic transmission. Relay function: Seat Heating. Belt Tensioner Wheels & Bkts. Suspension Ball Joints. Relay function: Fuel Pump. Relay function: Water pump after-run. Relay function: Battery main switch. Relay function: Interior Blower. Relay function: Rear window wiper. Condition is Used. Audi VW Skoda Seat ECU & Fuel Pump 4-Pin Grey Relay (No 373) 8D0951253A. Part Number: 8D0951253A. Genuine 4 Pin Grey Relay No. 373/ ECU & Fuel Pump Relay. Genuine Audi / VW Part. VW Caddy Golf Bora Passat Bettle Polo Sharan Touran Fox. 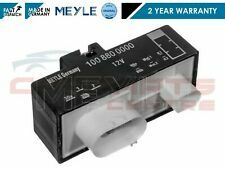 1 x RADIATOR FAN CASTOR RELAY MEYLE GERMANY 2 YEARS WARRANTY FITS Description Model Year kW HP cc Build VW GOLF Mk IV (1J1) 1.6 08.97 - 05.04 74 100 1595 Hatchback VW GOLF Mk IV (1J1) 1.6 08.00 - 06.05 75 102 1595 Hatchback VW GOLF Mk IV (1J1) 1.6 FSI 01.02 - 06.05 81 110 1598 Hatchback VW GOLF Mk IV (1J1) 2.0 07.98 - 05.04 85 115 1984 Hatchback VW GOLF Mk IV (1J1) 2.0 4motion 10.00 - 06.05 85 115 1984 Hatchback VW GOLF Mk IV (1J1) 1.9 SDI 08.97 - 06.05 50 68 1896 Hatchback VW GOLF Mk IV (1J1) 1.9 TDI 10.97 - 05.04 66 90 1896 Hatchback VW GOLF Mk IV (1J1) 1.9 TDI 4motion . Heater Resistor / Blower. Water Pump. Service Filter Kits. STABILISER / ANTIROLL BAR LINK. Antiroll Bar Links. Fan / Drive Belt. Antiroll Bar D Bushes. Fuel Injectors. Ibiza 1993-. Sharan 1996-2010. Octavia I 1997-2011. NEW 109 ECU FUEL PUMP RELAY. Bora 1999-2005. Relay function: Fuel Pump. A3 1997-2003. Combi Switch Function: Lock. Belt Tensioner Wheels & Bkts. Suspension Ball Joints. Multifunctional Relay. Rear Lights. Front Exhausts Cats. Estimates can be provided beforehand but prices may differ upon ordering. The compatibility is only a guide. Number of Poles 4 -pin connector. Manufacturer OE Number Reference info. Number of Poles 5 -pin connector. Number of Poles 3 -pin connector. Number of Poles 2 -pin connector. Number of Poles 7 -pin connector. Relay 167 removed from mk4 golf. Lucas 37873 Relay GM 90069864 1008300014 wash wipe Relay. Automotive Surplus UK LTD.
VW GOLF MK4, BORA FROM 11.97. ITEM NUMBER C790. A NEW FUEL PUMP RELAY RELAY. AUDI A3 FROM 09.96 TO 05.03. 1 x FUEL PUMP RELAY RELAY. AS SHOWN IN THE PICTURE. 05.99 - 05.03. AJQ, APP, ARY, AUQ. Radio Supression Relay. To fit: 940 series with petrol engines. 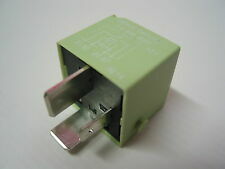 This relay is also used as a A/C fan relay, and a 'Hot Spot' relay on the 200 and 700 series cars. Length 110 mm. Width 51 mm. Height 76.5 mm. Number of Cylinders 4. Observe service information. Number of Poles 6 -pin connector. Number of Poles 3 -pin connector. Number of Poles 1 -pin connector. Belt Tensioner Wheels & Bkts. Suspension Ball Joints. Relay function: Fuel Pump. Relay function: Fan, engine cooling. Relay function: Suction pipe pre-heating. Multifunctional Relay. Rear Lights. Front Exhausts Cats. 1 x FUEL PUMP / ECU RELAY. 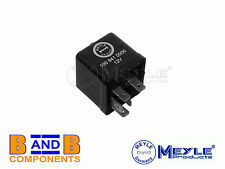 MEYLE GERMANY 2 YEAR WARRANTY Brand new "109" (ECU) relay for many VW Audi SEAT Skoda diesel engined models. OE REF 1J0906381A / 1J0 906 381 A 357906381A / 357 906 381 A PLEASE LEAVE VEHICLE REGISTRATION NUMBER AFTER PURCHASE TO AVOID ANY DELAYS IN THE DELIVERY PROCESS!. 1 x HAZZARD LIGHT RELAY OE REF: 191 953 227 / 191 953 227A / 111 953 227D 1H0 953 227 / 6U0 953 227 MEYLE GERMANY = 2 YEARS WARRANTY Fits: VARIOUS VAG GROUP VOLKSWAGON / AUDI / SKODA / SEAT.